​Founded in 1921, Soroptimist International is a global volunteer organization with a network of over 75,000 club members in 122 countries. Advocating for human rights and gender equality is at the heart of Soroptimist International’s advocacy work across six UN Centers, where our UN representatives ensure that the voices of women and girls are heard. Our members work on grassroots projects that help women and girls achieve their individual and collective potential, realize aspirations and have an equal voice in communities worldwide. Soroptimist, meaning best for women is particularly concerned with providing women and girls access to education, as this is the most effective path to self-determination. 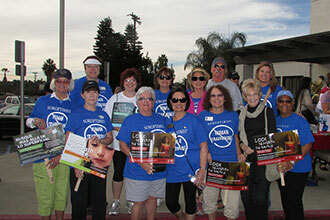 Soroptimist International of Oceanside-Carlsbad (SIOC), located in North San Diego County, California is comprised of over 70 members. We are a 501 (c)(3) non-profit organization. Our Tax ID number is 95-6122380. Our mission is to improve the lives of women and girls through programs leading to social and economic empowerment. We reach our goals through teamwork, fundraising, grants and hands-on community service. or 760-518-1836. Shoes will be collected until May 24th. We do several fun events each year to raise money for our Community Service Grants. Find out what we're doing, and how you can join in. Find out about the grants and scholarships we give, and other ways we are involved in the Oceanside and Carlsbad communities. Information for those who are interested in becoming a member, and information for our members, such as forms, lists and other information.